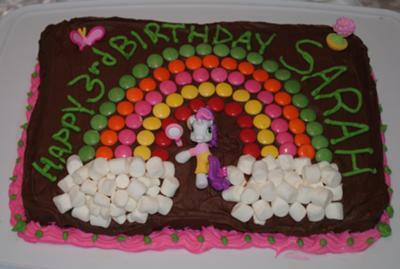 Sarah loved her My Little Pony Rainbow Cake. As I am not an artist buying figurines (ponies, cars, dinosaurs) is the best way for me to make kids cakes fun and easy. I used chocolate frosting for the base. Then added smarties for the rainbow. When using marshmallows for the clouds I just needed to squish them down together. This way they would not fall off. I then just added coloured vanilla frosting around the edges and for the writing. I was very happy with the finished result. I am the official cake maker for the kids in my family now. I am going to make a race car one soon. I really love this website. It has given me great ideas. Even if I tweak them a little bit. The easier the better. The kids happy faces makes it all worth it. I hope this has given someone a step in the right direction. Click Here for My Little Pony Party Ideas!